Sprinkle pork with garlic pepper. In 12-inch nonstick skillet, heat oil over medium-high heat. Add pork to oil. Cook 8 to 10 minutes, turning once, until pork is no longer pink and meat thermometer inserted in center reads 145°F. Remove from skillet to serving platter (reserve pork drippings); keep warm. Meanwhile, in small bowl, stir raspberry spread, water, vinegar and chile; set aside. Make rice as directed on package. Stir in remaining rice ingredients; keep warm. In skillet with pork drippings, pour raspberry mixture. Cook and stir over low heat about 1 minute or until sauce is bubbly and slightly thickened. 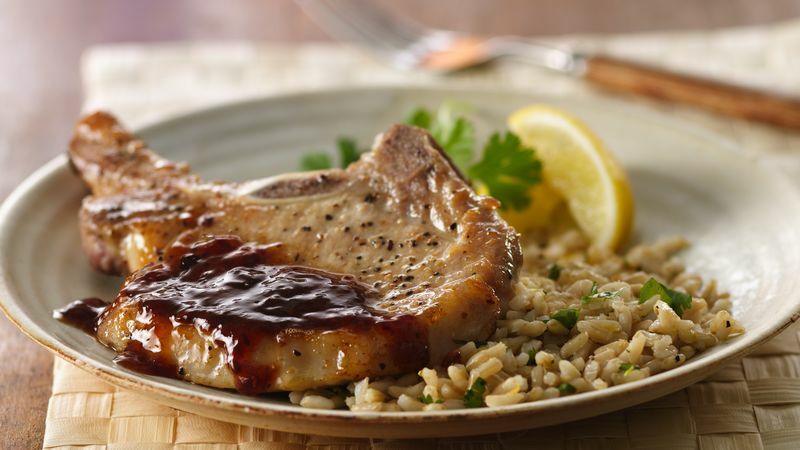 Serve pork chops with sauce and rice. Substitute other flavors of fruit spread for the raspberry, such as apricot or peach, and use cider vinegar instead of raspberry vinegar.